The war in Europe is over. Now, to turn our attention to the Pacific. “We may allow ourselves a brief period of rejoicing; but let us not forget for a moment the toil and efforts that lie ahead.” — Winston Churchill. For the past 18 months, it’s felt a bit to me like we’ve been fighting a war on two fronts: On the one hand, against Pauline Marois and the PQ at the provincial level, and on the other hand, against Stephen Harper and the Conservatives at the federal level. One of the two fronts of this war was defeated last night, as the PQ was thrashed at the ballot box and earned its worst election result in 44 years. Now, it’s time to turn our focus to the other front. 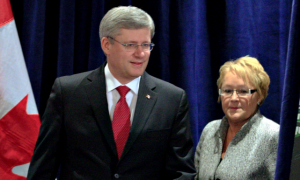 Despite ostensibly occupying opposite sides of the sovereignty debate and of the left-right political spectrum, Harper’s Tories and Marois’s PQ have a lot in common. Both came to power on a wave of anger against Liberal corruption amidst grandiose promises to clean up government, and both took corruption to new heights. Both have been engaging in the politics of fear and division. Both have been trying to rig the electoral system to deny votes to their political opponents — Marois via her paranoid accusations about “students from Ontario” trying to steal the election, and Harper via the Orwellian-named “Fair Elections Act” that is anything but. Since coming to power, both have done pretty much nothing I agree with and plenty that makes my blood boil. Stephen Harper once infamously said that “You won’t recognize Canada when I’m through with it”. That statement turned out to be eerily prophetic. The Economy. The Tory pet issue, and the one on which it runs its campaigns. Really? Not so much. Under Harper, Canada went from having a balanced budget and an annual surplus to running the biggest deficits in Canadian history. Yes, some of that was due to the global economic recession, but a lot of that has to do with the Tories’ spending priorities. The Environment. Harper withdrew Canada from the Kyoto protocol, muzzled scientists from researching or even talking about climate change, destroyed records, and stripped away environmental protections in favour of his friends in the oil industry. In fact, last year, Canada was ranked dead last out of of 27 OECD nations for environmental protection. Statistics Canada. Scrapping the mandatory long form census over the objections of pretty much every public poliymaker and everyone who’s ever taken a statistics course in their life. The War on Science. Tories decided that science had to either support their positions, or else science was evil. If the above points weren’t enough for you, Here is a pretty comprehensive (and frightening) chronology that was painstakingly compiled and that ought to make you shake in your booties. Corruption. Where to begin? Losing $3 billion dollars. Election robocall scandals, and lying to senior citizens. Mike Duffy. Lots and lots more. The status of women. First Nations relations (or lack thereof). The bloated Omnibus bills. Proroguing Parliament to avoid answering questions he doesn’t like. The list goes on. And on. And on. This two-front war has left many of us exhausted, our resources and emotional stamina drained. Many of us here in Quebec have been too preoccupied with the PQ to turn much attention to what’s going on in Ottawa. The immediate existential threats to our basic human rights that Marois proposed seemed the more urgent problem, and we had an imminent provincial election to worry about. So we focused our efforts here. But now, it’s time to turn our focus to the other direction, and do everything in our power to make sure that the next election result ensures that Stephen Harper and his Tories can do no further damage to Canada. They’ve done far too much already. Bye bye Pauline. Don’t let the door hit you on your way out. Watch out, Stephen, you’re next.